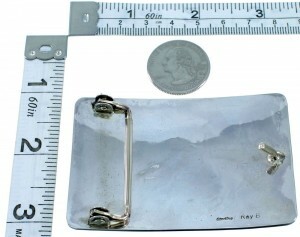 Belt buckle measures approximately 1-7/8" long, 3" at widest point, will fit a belt that is up to 1-1/2" wide. This is a wonderful piece of Navajo artistry! This piece of Native American jewelry is Navajo crafted by artist Raymond Begay, out of genuine sterling silver, along with real Turquoise and Coral chip inlay. The inlay is gently set, creating lovely water wave designs. In Native American beliefs, the water waves design represents continuous life. 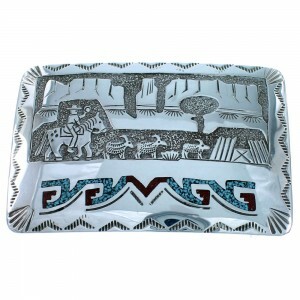 Hand crafted silver work creates stunning images that depict the every day life style of the Native Americans, which includes a shepherd herding goats, landscape scenery, and other breathtaking designs. Stamped patterns accent the buckle for an incredible finish. The stunning detail in this piece will be sure to draw plenty of attention! Belt buckle is stamped sterling and hallmarked by the artist.